It is said that a picture is worth thousand words, so today, I’ll let the pictures talk. And they will surely talk a thousand words. 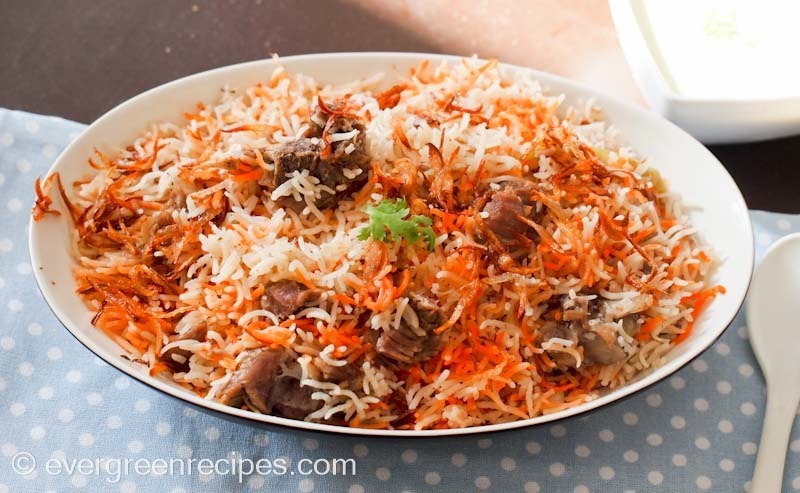 This Biryani is a special recipe that we prepare when we have guests who are tough to please, this will make them appreciate your culinary skills even before they start having it, because the aroma, which we get from coriander fennel seeds, I am sure whoever smells it, will be enticed to have it even more. The Mutton Potli Biryani is a perfect special dish to prepare for weekends when the whole family sits together to enjoy the meal. I have tried my best to keep it as simple as possible without sacrificing on the taste of it. You can prepare this amazingly delicious Mutton Potli Biryani in your own kitchen by following my step by step recipes along with photos. I hope everyone who eats this will remember it for a long time. Enjoy. 1. Take all the ingredients given in table “Ingredients for potli” in a plate as shown in the image below. 2. Take a muslin cloth, put the potli masala in it and tie it tightly. 3. Take the mutton into pressure cooker along with 5 glass of water and add potli into the pressure cooker. Close the lid and pressure cook it on high heat for one whistle the low the flame and cook for 10-12 minutes till mutton cooked properly. Let the pressure settles down. 4. Discard the potli and take out the water into another bowl and mutton pieces into another bow. don’t drain the water because you have to cook the rice with this flavored water. 5. Grind all the ingredients together given in table “ Ingredients to grind the paste” to make fine paste. you can add 3-4 tablespoon while grinding. Heat another big wok with mustard oil and sauté with onion. 6. Add slit green chilly in the wok and fry it till onions are light golden in color. Add ground paste in the wok. 7. Cook the spices for 2 minutes on medium flame. Then add cooked mutton pieces into the wok and cook it on low flame till oil shows separately. 9. Cook covered on high heat till the water boils then low the flame and cook it till the rice is 3/4 cooked. Dissolve food color in kewra. 10. 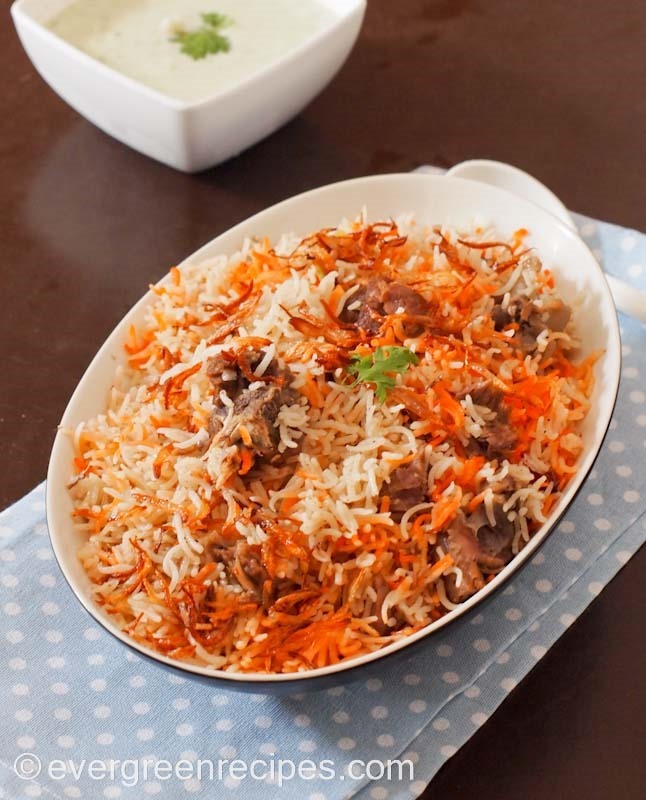 Sprinkle color on the biryani and garnish with fried onions. Cook covered on very low flame till the rice cooked properly. Switch off the flame. 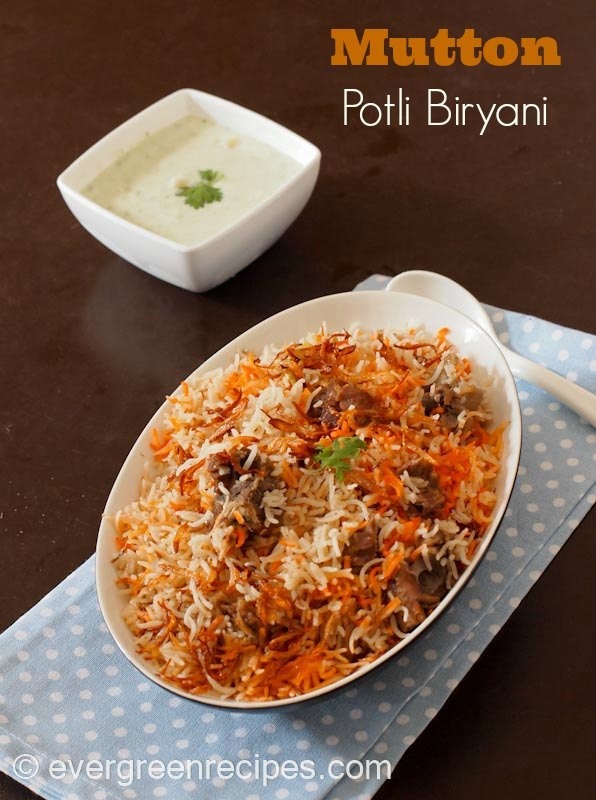 Biryani is ready to serve, serve hot with raita and salads.